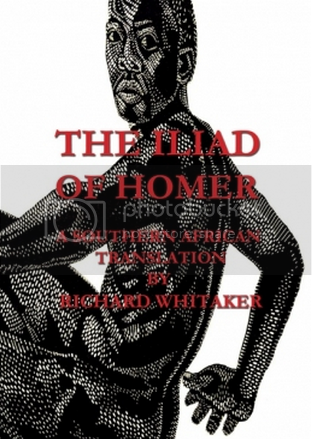 Richard Whitaker, Emeritus Professor of Classics at the University of Cape Town, has released a new southern African translation of Homer’s Iliad. More than 10 years in the making, Whitaker’s Iliad introduces a series of South African English words into the text while still managing to correspond almost line-for-line with the original. The Iliad of Homer: A Southern African Translation will be launched at The Book Lounge in Cape Town on 8 August. See you there! Richard Whitaker’s translation of the Iliad has been more than ten years in the making. His poetic translation makes use of a flexible 5-beat line, usually ten or eleven syllables long. The translation uses many South African English words such as amakhosi (commanders), kgotla (assembly), outspan (unyoke), kloof (glen), sloot (ditch), assegai or umkhonto (spear). For readers to whom such words may be unfamiliar, a Glossary at the end of the book explains their meaning and gives the Standard English equivalents. Such is the richness of the Iliad that it would be impossible to explore here all that the epic has to offer – for instance, the depth and subtlety of its characterization, the poem’s narrative power and the brilliance of its similes. Instead I should like to draw attention to just a few of the epic’s central concerns. All great creative artists – and Homer unquestionably ranks among them – go beyond sheer story telling to use narrative to reflect on the nature of their world and their society. So, through the narrative of the fighting at Troy, the Iliad explores the complex nature of the hero, his duties and rewards, his relationship to the gods and the wider society around him – all that goes to make up the heroic code. At the simplest level, the hero is a warrior whom his people reward with material goods and with honour because he fights to protect them; while he, for his part, faces imminent death for the sake of those goods, and honour, and the personal praises that he wins by success in combat.